An image from a surveillance video of suspected jewelry thieves. Police are seeking the public’s help in identifying two men suspected of breaking into fives businesses last week and making off with $200,000 in stolen jewelry. 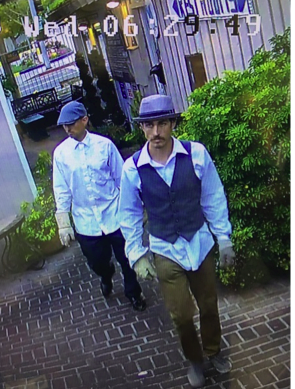 The suspects are described as two white male adults wearing long pants, button-up long sleeved shirts, and heavy duty gloves. Both suspects also wore hats. The break-ins occurred about 5 a.m. Wednesday, July 26, at 577 S. Coast Highway, the Cliffs shopping complex. Traffic control. El Paseo. 9 a.m. Sink hole. Burglary. 2400 block of Glenneyre St. 9:20 a.m. Someone accessed a home during the evening. Fraud. 500 block of Mystic Way. 10:24 a.m. Someone opened accounts in a resident’s name. Traffic collision. S. Coast Hwy. Witnesses who observed a vehicle hit two parked cars and leave the area provided police with a license plate number that led to a suspected hit and run driver. Steven Craig Sowell, 67, of Laguna Beach, was arrested at his home for suspicion of DUI. Burglary. 1900 block of Laguna Canyon Road. 11 a.m. Someone apparently used a key to get in. Theft. 100 block of Irvine Cove Dr. 12:41 p.m. A resident reported a $2,400 loss. Vehicle burglary. 200 block of Beverly St. 7 p.m. A thief who broke into a truck left behind an unusual calling card: a Smith and Wesson revolver stolen on June 13 from an Orange gun shop. Traffic collision. 8:50 a.m. Goff Street. A motorcyclist suffered a leg injury in a collision with a car. Disturbance. 800 block of Wendt Terrance. Police arrested Randall Lee Marquette, 52, for suspicion of felony domestic violence and sought an emergency protective order against him. Though Marquette allegedly barred police from his home, they did enter and found his wife with multiple bruises and other superficial injuries. Bail was set at $50,000. Vehicle burglary. 20300 block of Sun Valley Road. 2:44 p.m. Money and knives were taken from a vehicle, which was left locked but with a window cracked. Burglary. 300 block of Ruby St. A resident found pry marks on windows of his property. Fraud. 300 block of San Tropez Court. 4:38 p.m. A resident’s credit card was used without authorization. Brandishing weapon. 20600 block of Laguna Canyon Road. Jason Thomas King, 36, was arrested for allegedly brandishing a knife and trespassing. Bail was set at $20,000. DUI. 500 block of Glenneyre St. 11:45 p.m. Zachary James McGuinness, 21, of Laguna Beach, was arrested for suspicion of DUI after he allegedly rammed one car in a parking lot and then plowed into a garage door. A city building inspector red tagged the garage, though no residents were displaced. The motorist, who had a blood alcohol level of .08 percent, had earlier been ejected from a bar where he apparently was toasting his 21st birthday, Sgt. Jim Cota said. Missing person. 300 block of San Tropez Court. 5 a.m. A mother reported the disappearance of her 14-year-old son, her purse, a cellphone and his backpack. Fraud. 1100 block of Keller Way. 1:31 p.m. A resident who tried to open a bank account learned her social security number is already is in use. Traffic collision. Brooks St. 3:33 p.m. Man on a scooter declined medical aid despite a broken arm after a collision with a vehicle. Traffic collision. Diamond St. 8:15 p.m. A northbound vehicle struck a 50-year-old Laguna Beach woman crossing Coast Highway in a crosswalk against a red light. The visibly intoxicated pedestrian suffered a broken ankle. Police said alcohol was not a factor impairing the actions of the motorist, identified as a 54-year-old Pasadena resident.